Fuuka and Nagi arrive home from school. Takaharu offers them some delicious senbei, but instead, out of the tin pops Kinji ready to take their lives. He and Takaharu fight and make a mess of the living room. Yakumo and Kasumi go about their business. But Fuuka will not stand for this insanity. She tells them they better clean up after themselves, but they continue going at each other, much to Fuuka’s frustration. Kyuuemon asks Masakage to help gather more fear, but he is more concerned with finding ways to play with the Last Ninja’s grandchildren. Besides, if they take care of the Ninningers first, it will make their fear collection easier. Masakage continues to intentionally mispronounce Kyuuemon’s name. He heads out and attaches a Sealing Shuriken to a payphone which becomes Youkai Yamabiko. Masakage tells him to find a way to prevent them from henshining. 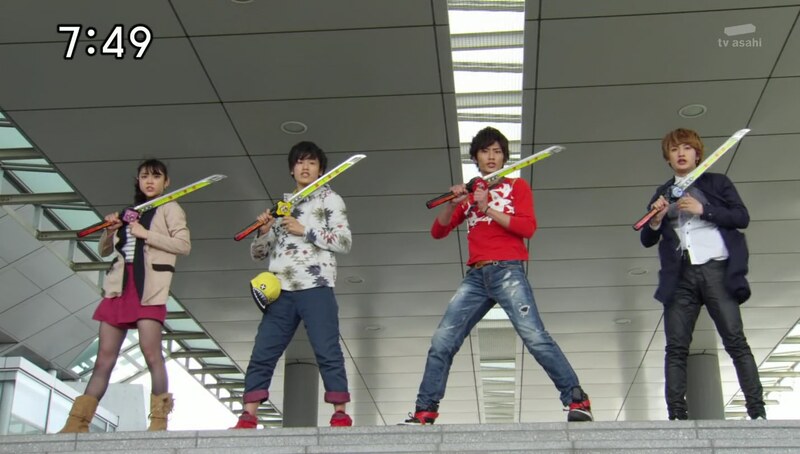 Back at the dojomanse, Fuuka is scolding Takaharu and Kinji. She tells them no meals if they fight inside and trying to kill people in the dojomanse is strictly forbidden. Father says seeing Fuuka like this reminds him of mother. The Gamagama-jus and hamburger alert them to a Youkai and they hurry out. They come across the Jukkarage and they henge. The Jukkarage run in all directions so the Ninningers split up to follow. Fuuka thinks she’s got her group taken care of, but Kinji saves her from one last Jukkarage. Fuuka’s instincts make her whack whoever’s behind her. And that’s Kinji. She apologizes and he dehenshins. Kinji then apologizes for being a pain and for causing a rift between her and her brother. Fuuka says it’s okay, but Kinji thought siblings are supposed to get along. Of course not, Fuuka says. 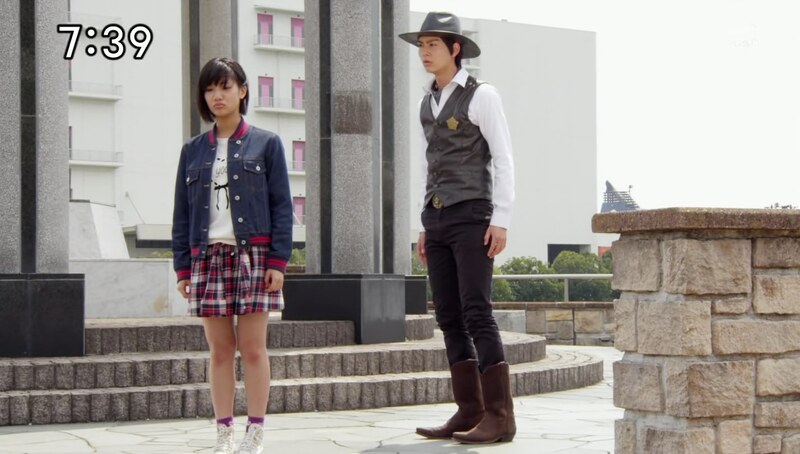 She asks Kinji if he has any siblings. He says his brother died when he was a kid, but he does remember that he was a great Youkai hunter. That’s why he needs to be Grandpa’s student so he can follow in his brother’s footsteps. Kinji again apologizes for causing so much trouble. Meanwhile, Yamabiko calls Takaharu and pretends to be Fuuka and Grandpa to get him to gather all their Shurikens to free them from the Youkai. Takaharu runs to Yakumo, Kasumi and Nagi and asks for their Shurikens. They hand them over and Takaharu goes running. He gets another call from “Fuuka” and says someone will come to get the Shurikens. Yamabiko turns a Jukkarage into a man who meets with Takaharu. Takaharu hands the Shrikens over and the man leaves. Kasumi, Yakumo and Nagi come running and realize Takaharu’s been played. They go after the man who has just handed the Shurikens over to Yamabiko. Yamabiko calls Fuuka and pretends to be Takaharu who says he needs her Shuriken to fix the person he’s just hurt with Ninjutsu. Fuuka asks “Takaharu” to put the hurt person or a next of kin on the phone so they can apologize. Yamabiko tries to cover and says someone will come to pick-up the Shuriken, but Fuuka insists she will come herself. Yamabiko tries to get her to stay away, but Fuuka hears the plaza clock’s bell ringing and says she’ll be right there. Oops. But it’s okay. The Ninningers pull out their Ichibantou and use their Ninjutsu to fight the Jukkarages instead. 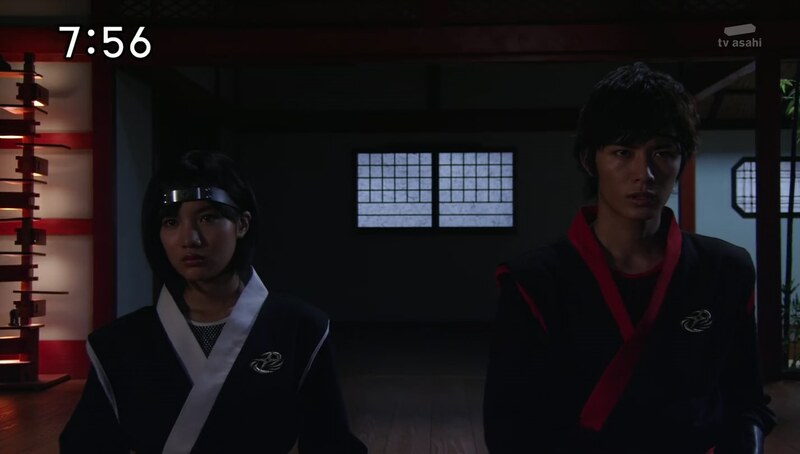 Fuuka and Kinji arrive and henge after sorting out the misunderstanding. Yamabiko farts and they kick him down the stairs. Fuuka tries using Pitfall Trap Technique to get Yamabiko, but she’s the one that falls in instead. Kasumi thinks Fuuka’s being a klutz, but Kinji signals Fuuka to come out now. Fuuka jumps out from the ground behind Yamabiko and grabs the Shurikens. Her cousins compliment her clever plan as she hands them their Shurikens to henge. The Ninningers face the Jukkarage again, but Yamabiko goes around pretending to be one of the cousins to try and trick the others. But Fuuka doesn’t fall for it because she knows Takaharu would never ask for her help. Kasumi suggests they use codenames so they won’t get tricked by Yamabiko. They work together using their different attacks and the siblings deliver the finisher together. Star-san takes a selfie and Yamabiko explodes. Fuuka thanks Kinji for saving her and says he now has permission to assassinate in the dojo between 8 and 6. Kyuuemon embiggens Yamabiko and the Ninningers summon their OtomoNin. But Yamabiko uses some high frequency sound to interfere with them. Fuuka asks Wanmaru to let out an even higher frequency sound. The Ninningers combine into Shurikenjin and Kinji does Bison King. They quickly finish off Yamabiko. Later that night, Takaharu is alone in the living room training when Fuuka walks in, also ready to train. Takaharu says it’s a surprise to see her taking the time to train on her own. Fuuka says she knows she has to take care of him and to do that, she must become stronger than him. Fuuka asks if she really can become stronger. A good episode. Again, I love when they do the family stories because there’s a lot of fresh material that can be done around that theme. It was great to see Kinji and Fuuka’s scene talking about family. I like that Kinji’s not necessarily telling everyone about his father and brother, but he’s not keeping it a secret either. I especially enjoyed that last scene with Takaharu and Fuuka. For one thing, it’s awesome to see a serious Takaharu for once. But also it reinforces their sibling relationship. Just a lot of great possibilities with the family dynamic. 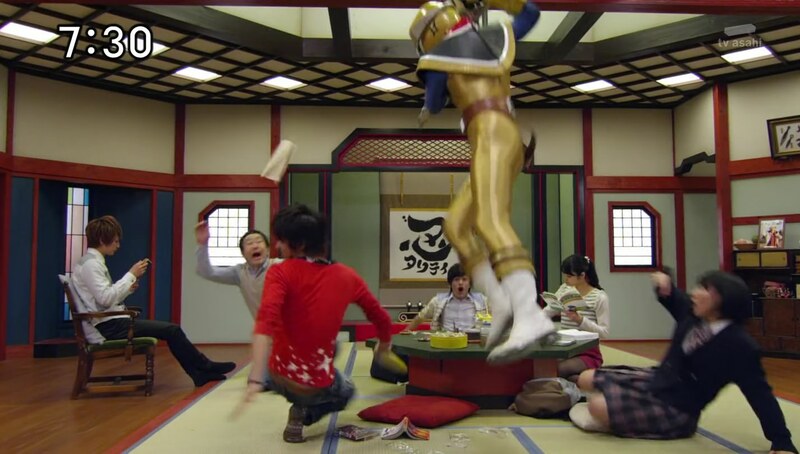 And I think Ninninger has been doing better and better fleshing that out. The MOTW was okay and his powers were clever and amusing. The fights were great this episode as well. But I’m definitely noticing how Nagi always gets the best fight choreography. Him being very agile and jumping all over the place fits with him being the youngest, but I don’t think they’ve really allowed that trait to come out in non-morphed scenes. Especially since we always see Yakumo tossing him around whenever they’re sparring and training.